A common misconception about cleaning products suggests that a bigger pH means superior cleaning. But this is not always the case. The pH of a cleaning products does not relate to its cleaning performance or strength; it just indicates the concentration of hydrogen or hydroxide ions. 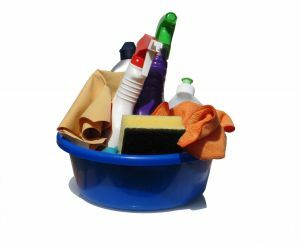 Understanding the importance of pH is essential when choosing cleaning products for a particular job. The pH scale goes from 0-14, 7 being considered neutral. Anything below 7 is considered acidic and anything above 7 is considered alkaline. Alkaline products are better at cleaning dirt, grease, oils and other organic items. Acid products are better for removing calcium, rust and other mineral non-organic items. – Chlorine bleach (pH 11-13): At the top of the alkaline level, therefore corrosive and to be use with caution and not in all surfaces as these can be damaged. – Oven cleaner (pH 11-13): The same as bleach, so ideal to cut through grease and grime, but protect the kitchen floor and worktop when using it as they could be damaged. – Baking soda (pH 8-9): It has enough alkalinity to clean grease and dirt but not enough to label it as a corrosive product, so it is a great option to use at home. – Washing up liquid (pH 7-8): The neutrality makes this cleaning product ideal for daily cleaning. Most surfaces will not be damaged and it can be used in hundred places around the house, not only to do the washing up. – Natural stone cleaner (pH 7-10): Most natural stone surfaces can be easily damaged with cleaning products that are too alkaline or too acidic; hence the neutrality on these stone cleaning products. – Vinegar (pH 3): As a natural product, most would think vinegar is safe to use almost everywhere in the house, but it is not the case. Vinegar is quite acidic so it can damage some delicate surfaces (e.g. wood or limestone). On the other hand, it is great for removing mineral deposits (e.g. lime scale). – Lemon (pH 3): Like vinegar, lemon is very acidic. Some surfaces, like drains, will benefit from a good scrub with lemon, but this product can damage other surfaces, so be careful where you use it. – Toilet bowl cleaner (pH 1-3): Very acidic product, so ideal to remove minerals and other non-organic substances. As it is at the end of the pH scale, you have to be careful when using it. So, what cleaning products do you have at home? Have you ever checked their pH level? This entry was posted in Cleaning products, General, How to... and tagged cleaning advice, cleaning chemicals, cleaning products, pH levels of cleaning products on 31/05/2013 by admin.